This premium fence kit with electric fence tape comes with everything you need for safely keeping goats – makes a 50m, 4-row fence. This VOSS.farming complete goat fence kit comes with everything that goat owners need to build secure fencing. This fence is ideal for keeping all types of goat – even with horns. This kit from VOSS.farming® includes the "impuls V70" mains energiser. It is extremely powerful thanks to the innovative PowerShock technology. This ensures your fence always provides a sufficient level of security. A microcontroller permanently monitors the fence voltage and a fault on the fence is immediately indicated by a red light. The polywire has very good conductivity and is suitable for very long fences. The electric fence tape is suitable for building a 4-row fence with a length of up to 50 metres. "farm 125" robust plastic posts are provided to ensure the fence stands firmly. All connection cables and posts needed for your goat fence using electrical fence tape are included in the kit. 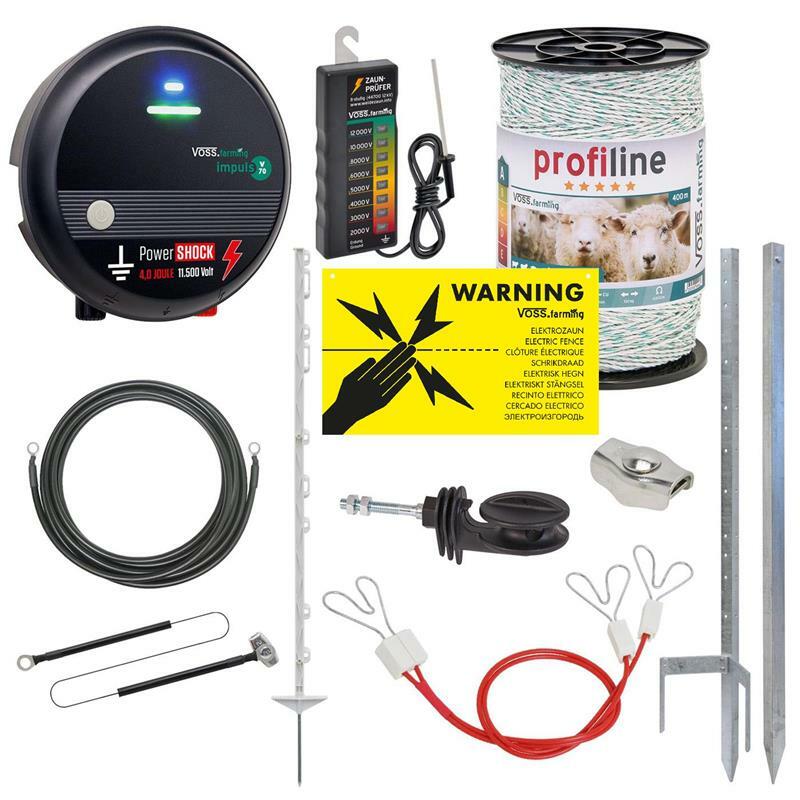 This complete kit includes a wide range of accessories such as a fence tester or warning signs to indicate the electric fence. The VOSS.farming complete goat fence kit is a great choice, as the fence system is quick and easy to assemble.